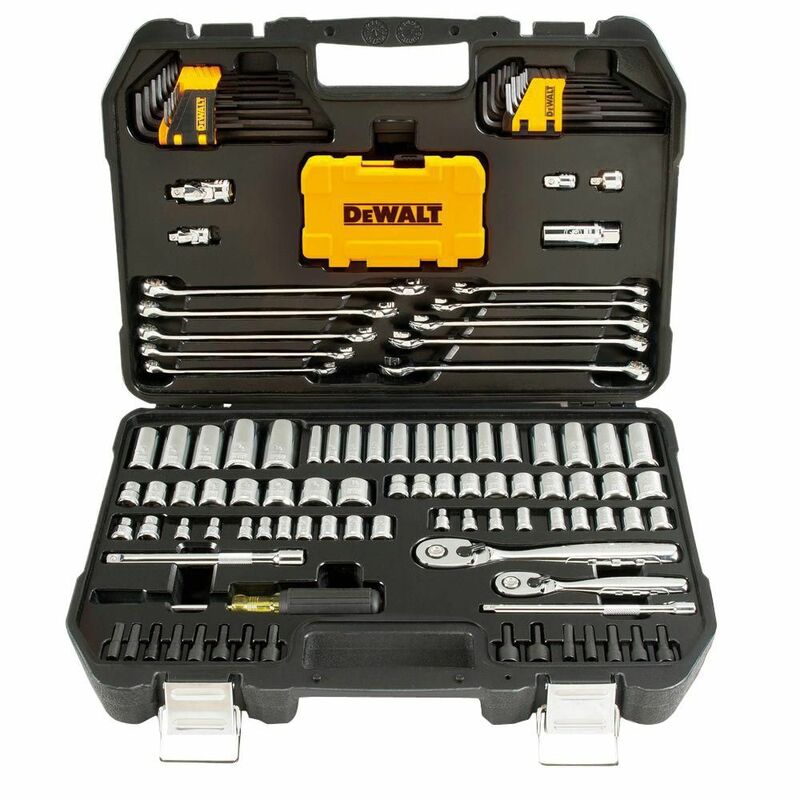 With the 142 Piece Mechanics Tool Set, you can be sure you have the right tool for the job. The set includes two Pear Head ratchets and a variety of sockets, extensions, universal joints and adapters. The sockets include DirectTorque; technology to help prevent rounding of fasteners and to provide better grip. Quick Release, 72 Tooth Ratchet for high torque ratcheting. Durable anti-slip vinyl bit driver with maximum comfort. The DEWALT DCN682 18-Gauge Flooring Stapler drives 18-Gauge 1/4-inch narrow crown staples from 1/2-inch to 1 1/2-inch making it ideal for installing solid and engineered hardwood ranging in thickness from 3/8-inch to 5/8-inch. A contact arm optimized for flooring, along with a tool-free adjustable base, help to drive fasteners accurately at the proper angle and depth. A brushless motor powered by a DEWALT 20V MAX Lithium-Ion battery make the DCN682 ready to go to work without the hassle of using gas, a compressor, or a hose. Tackle jobs both large and small with the features of a pneumatic tool and the freedom of cordless. Maximum initial battery voltage (measured without a workload) is 20 volts. Nominal voltage is 18. This exclusive DeWALT 2pk Kneepad Combo includes the DG5204 Professional Kneepad with Layered Gel (features a non-skid, heavy-duty cap designed for added stability and wear) and the DG5224 Heavy-duty Flooring Kneepad (features a heavy-duty, dual-layer, ballistic poly fabric and tough, textured PVC outer shell). Both kneepads have slip-buckle fastener system with adjustable straps. 142 Piece 1/4 in & 3/8 in Drive Mechanics Tools Set With the 142 Piece Mechanics Tool Set, you can be sure you have the right tool for the job. The set includes two Pear Head ratchets and a variety of sockets, extensions, universal joints and adapters. The sockets include DirectTorque; technology to help prevent rounding of fasteners and to provide better grip. 142 Piece 1/4 in & 3/8 in Drive Mechanics Tools Set is rated 4.8 out of 5 by 89.